Flowering plants depend on pollen for fertilization and reproduction. Pollen is made up of small grain-like particles that are carried from flower to flower by the wind, insects and small animals. Flowering plants, like animals, reproduce sexually. Flowers have both male and female parts and require the joining of a sperm and an egg to produce seeds. The male part of the flower is called the stamen. The stamen has a thin filament tube base and a thick pod-like top called the anther. Stamina and anthers (sides) with pistil and stigma (center). Pollen is produced in sacs inside the anther. When the pollen grains mature, the anther releases them. The female part of the flower is the pistil, which is a long tubular receptacle. The sticky top part of the pistil is called the stigma. Close-up of pistil and stigma. The base of the pistil contains the ovary, inside of which is the ovule, the embryo sac and the embryo sac's egg. 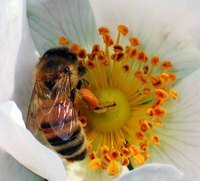 Each pollen grain contains sperm cells. When a grain sticks to the stigma of a plant, the sperm cells travel down the pistil and fertilize the egg.